The doctrine of "Once Saved Always Saved" is absolutely not scriptural. Definitely, some of the scriptures that are often quoted to support this doctrine, seem to just do that. We will address a few of them and examine why they truly don't back-up this false doctrine. And I give unto them eternal life; and they shall never perish, neither shall any man pluck them out of my hand. My Father, which gave them me, is greater than all; and no man is able to pluck them out of my Father's hand. I and my Father are one (John 10:28-30). Abide in me, and I in you. As the branch cannot bear fruit of itself, except it abide in the vine; no more can ye, except ye abide in me. I am the vine, ye are the branches: He that abideth in me, and I in him, the same bringeth forth much fruit: for without me ye can do nothing. If a man abide not in me, he is cast forth as a branch, and is withered; and men gather them, and cast them into the fire, and they are burned (John 15:4-6). Being confident of this very thing, that he which hath begun a good work in you will perform it until the day of Jesus Christ (Philippians 1:6). When we read this verse by itself, it can easily be taken out of context. Paul's confidence is in the "the good work that was done in you". What is that then?The previous verse, Philippians 1:5 tells us the answer - the gospel. The saints of Philippi (the "you") were born again, baptized in Jesus' name and filled with the Holy Ghost. Then when Paul says "he" - Jesus - will continue to perform "it" - salvation - until the day of Jesus Christ, Paul is talking about the following generations of saints that obey the gospel of Jesus Christ, all the way to the second coming of Jesus Christ. Paul was definitely not referring to the Philippians as being "once saved always saved" - that back sliders will go to heaven. To an inheritance incorruptible, and undefiled, and that fadeth not away, reserved in heaven for you (1 Peter 1:4). Who are kept by the power of God through faith unto salvation ready to be revealed in the last time (1 Peter 1:4-5). First of all the word "kept" means "to guard or protect". By "the power of God" we are protected! How then? By faith! Peter placed the condition of having faith on making it to heaven. What kind of faith in God can we possibly have if we return to sin and live like the devil? Faith in God means being obedient, not disobedient. If we want to go to heaven, we must be born again and live a repentant lifestyle. It doesn't take many scriptures and much commentary to teach the exact opposite doctrine of once saved always saved is the truth. For this ye know, that no whoremonger, nor unclean person, nor covetous man, who is an idolater, hath any inheritance in the kingdom of Christ and of God. Let no man deceive you with vain words: for because of these things cometh the wrath of God upon the children of disobedience. (Ephesians 5:5-6). Christ is become of no effect unto you, whosoever of you are justified by the law; ye are fallen from grace (Galatians 5:4). 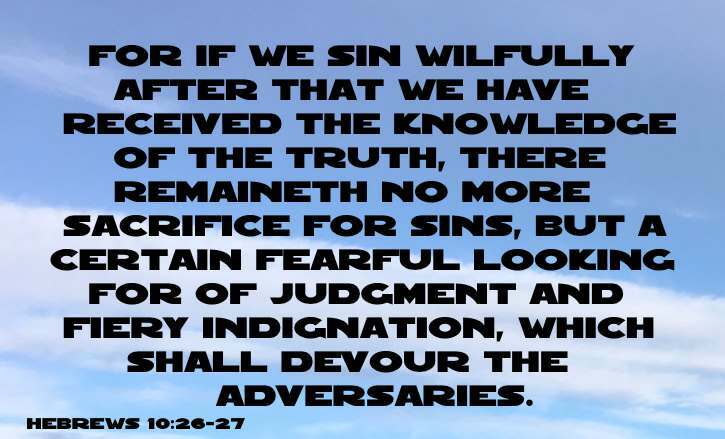 For if we sin wilfully after that we have received the knowledge of the truth, there remaineth no more sacrifice for sins, But a certain fearful looking for of judgment and fiery indignation, which shall devour the adversaries (Hebrews 10:26-27). 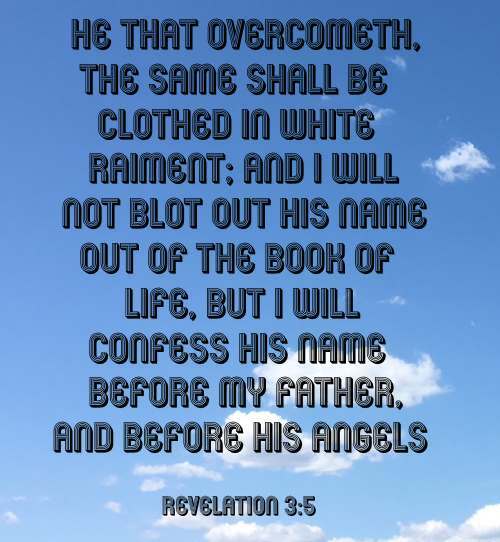 He that overcometh, the same shall be clothed in white raiment; and I will not blot out his name out of the book of life, but I will confess his name before my Father, and before his angels (Revelation 3:5). Wherefore let him that thinketh he standeth take heed lest he fall (1 Corinthians 10:12). As many as I love, I rebuke and chasten: be zealous therefore, and repent. Behold, I stand at the door, and knock: if any man hear my voice, and open the door, I will come in to him, and will sup with him, and he with me. To him that overcometh will I grant to sit with me in my throne, even as I also overcame, and am set down with my Father in his throne. He that hath an ear, let him hear what the Spirit saith unto the churches (Revelation 3:19-22). Some other scriptures that support a doctrine of "not once saved always saved" are 1 Corinthians 10:12, Hebrews 3:7-19, Hebrews 6:6, 2 Peter 2:20-22, and 2 Peter 3:17. A great example of this is the parable of the prodigal son that Jesus taught in Luke 15:11-32.